In Job 41, God asks a rather odd question. Not odd as in nonsense, but odd in that it is one of the most thought-provoking passages in the whole book. 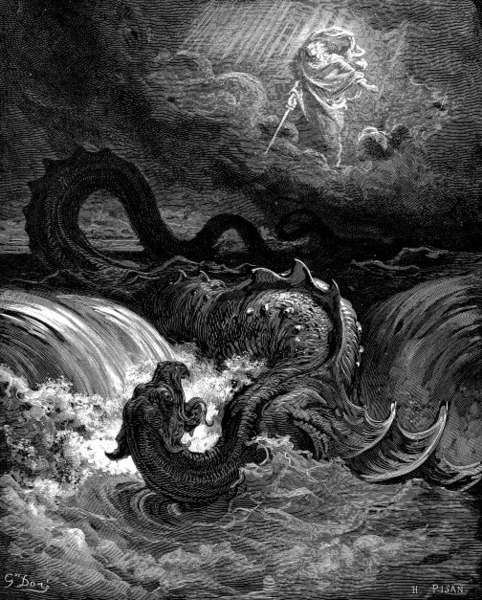 Keep in mind as you read these few verses that Leviathan represents the most fearsome sea creature imaginable. Also, try to keep track of the many suggestions for taming and domesticating the sea monster God lays out. Will it keep begging you for mercy? Will traders barter for it? Anyone thinking they have a way to tame that monster is living in a false hope, God says. But what is his point? It’s found in the very next question God poses. The book of Job consists in large part of speeches where many times the speaker seems to want to form God in his own image. As Job suffers, his friends tell him it’s because God has judged him worthy of punishment, that this is who God is in Job’s life: a punisher. Job repeatedly proclaims his conduct not deserving of punishment, and says if he only had an audience with God he’d tell God how unfair he’s being. God’s reference to Leviathan is designed to set them all straight. These men can’t even subdue and train a fellow creature. How can they hope to tame God and train the Creator to answer them the way they want, to speak comforting words at their behest? As C.S. Lewis wrote of the Christ figure in The Lion, The Witch and the Wardrobe, Aslan is “not like a tame lion.” God is not ours to mold and manipulate. Quite the opposite, in fact. God’s thoughts and ways and purposes are unsearchable, unknowable, beyond our limited ability to comprehend. (Romans 11:33.) But that is not to say we cannot know God in our limitations. Jesus is the way to understand God, as he assured his friends. And one day we will know fully, without limitation, all that God wants us to know. This is your assurance: the One who knows you fully now will give you full understanding when you stand in his presence. And he won’t fit your limited image of him. To the contrary, you will instead fit his. Admit it. This is much better than fruitlessly trying to tame God and domesticate him for your own personal needs. This entry was posted in Uncategorized and tagged Book of Job, Christlikeness, Jesus, Leviathan, Potter's clay. Bookmark the permalink. No point in pretending perfection. We can rest in his grace and strength! And what a wonderful rest it is, too. Thank God he is bigger than we can imagine. Ain’t that a blessing, Jeannie! Yes! We want to take the mystery out of God so we can feel more in control, so we create all our false images of Him and call them the Christian God. In doing so we lose the true fear of Him. He is not a tame God…..thank God! Jesus had a lot of those folks try to mold him into their idea of what a Messiah should be. He was having none of it. Amen, Michelle, what a day! Reblogged this on Sacred Scars. Thanks, Sharon. I hope your readers enjoy the post!